Christmas In Lagos: No Holiday On The Streets Christmas may be the season to be jolly, but a set of people in Nigeria's economic capital are not feeling the holiday cheer. 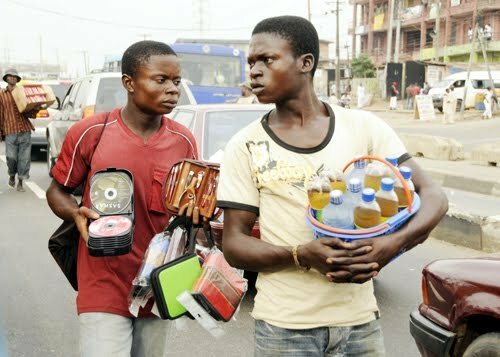 Hawkers on a major road on Christmas Day, Lagos. The Christmas holiday is always a time to be merry and joyous. Christmas is a time to spend with family members and close friends. Aside from its religious value, Christmas is an opportunity for us to pause our often whirlwind pace through life and enjoy family life. Christmas has always been the season of spreading good cheer, of spending time with your family and of sharing, caring and giving. It is a season of love and compassion and of family bonding. It is a moment when the women in the house bring out their biggest pots to cook enough jollof rice to feed an entire village. Chickens are beheaded, washed and fried. We put on our best clothes and either go visiting or wait for friends to come visiting. Regardless of the festivity of the holiday, there are still a few of us who still have to work at Christmas. And from what I have observed, there are two kinds of people who work on holidays like Christmas — those who have to and those who don’t have a choice. As a journalist, I am one of the first kind — those whose jobs do not allow them rest on holidays. Doctors, for example, have to be on standby in case of emergencies. The police force also cannot go on break, lest we get too drunk on Christmas wine and go on rampage. Basically these are people who just cannot go on a break for the greater good. Nurses, radio presenters, Fuel station attendants, toll gate attendants (sadly) and many others need to keep working for others to function. The other kind of ‘holiday workers’ are those we usually don’t think about. They are those whose family do not cook jollof rice. Those who do not see the difference between December 25 and every other day. They have to work every day or they will go hungry. We see these people on the streets everyday of the year without having much thought for them. These are the people you see pushing Gala and bottled drinks in your face while you are in traffic. These are the Nigerian versions of those who are referred to as ‘homeless’ in America. I decided to go out and spread a little love for them on Christmas Day. I also wanted to chat with at least one of these homeless people to hear their story and know where they are coming from. I knew it would not be an easy task though. These people do not trust anybody and may think that I am a KAI worker. KAI, Kick Against Indiscipline, is the agency in charge of clearing out street hawkers in Lagos. But I had a bargaining chip though. I had asked my wife to pack some rice and chicken with drinks for ten in case I get mobbed. So I headed to Orile Road on the Lagos mainland — a place with no shortage of traffic jams and street traders. The first person who caught my eye was a boy named Stephen. He wore tattered blue jeans and a very old t-shirt with the American band AC/DC's logo on it. He should be about 15 years old. In his hands were packets of handkerchiefs. What drew my attention to him was his agility. I just saw him chase after a swiftly moving car just to retrieve his money for a sale. Right after that, he was already trying to sell to the passengers of another car as if nothing just happened. I pulled to his side and asked him to come in. To my surprise he did not hesitate. He sat on the passenger sit asking me how many handkerchiefs I want. As I began to explain my mission to him, he started pleading with me. He though I was from KAI, he wanted to leave but I had used the central lock. After calming him down and even giving him a pack of my wife’s wonderful jollof rice, he was ready to talk. In fact he was excited to talk. My first question was how he ended up on the street. Stephen gave me a very sad story. According to him both his mother and father are alive. He is the only child of his father and mother’s brief union. His ordeal started when his cobbler father decided to have another wife. After bringing in the new woman, Stephen’s father became abusive to his mother. He would beat her at any opportunity. The beatings grew worse when the new wife started having children. Stephen’s mother finally decided that she had had enough and left the marriage and the house. With nowhere to turn to, she went back to live her parents but there was no space for a child. Stephen had to go back to live with his father and step-mother. Now all the abuse that was reserved for his mother was meted on him. He became a slave to his step-brother and sister doing every chore in the house. Soon, he heard that his mother has remarried, but when he visited his mother in her new husband’s house, she told him there was no room for him there. His mother did not even tell her new husband that Stephen was her son. As he spoke, I could understand his pain. Despite the way he had been treated by both parents, he never felt anger towards them. He never returned to his father’s house and he survives with the stipend his mother sends to him through his grandparents. It is part of this money that he used to buy packets of handkerchief to sell on the street. He is clearly a victim of circumstance in a country with no welfare system. His story was a touching one, though I also suspect it might just be what he made u) to tell his fellow street sleepers to get pity. Whatever the case may be, he lives off the 20 naira he makes as profit after selling a handkerchief for 50 naira. Even if he sells forty pieces a day, it still amounts to very little. School is not an option for him as he had dropped out in JSS3. I look at Stephen and other boys and girls like him on the street hustling on a day where others are ensconced in the warmth of family, hungry for food when many will throw away the excess of their Christmas feasts. After giving out the last pack of jollof rice, I started to regret not bringing more. I can’t feed the world, but it would be nice to spare some love for those who spend the holidays hustling on the streets.